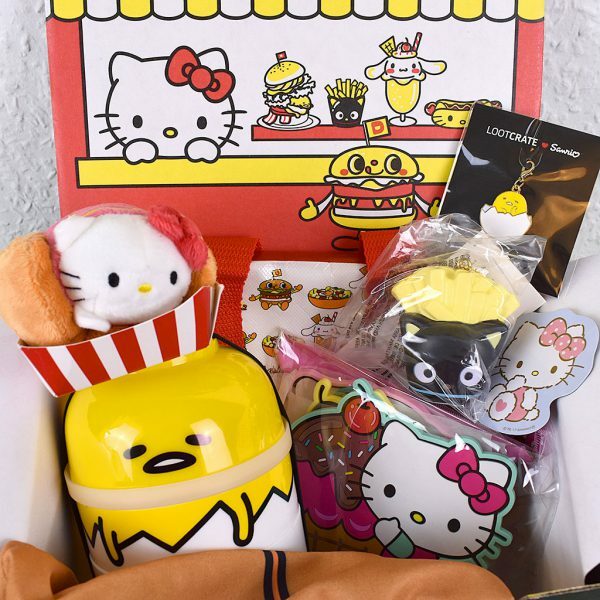 Sanrio Small Gift Crate Subscription Box - Fall 2017 - Super Cute Kawaii!! I recently received my second Sanrio Small Gift Crate. I’m not going to do a full review, since the Summer box review was so recent, but I thought you’d like to see what was inside this one. 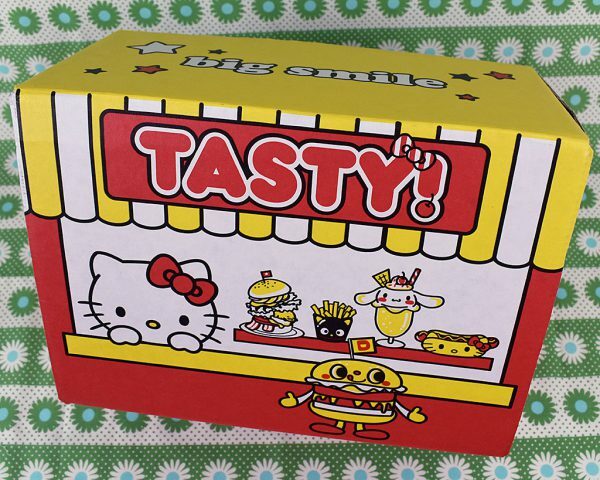 The Fall 2017 theme is Tasty, which means lots of kawaii food items – my favourite! 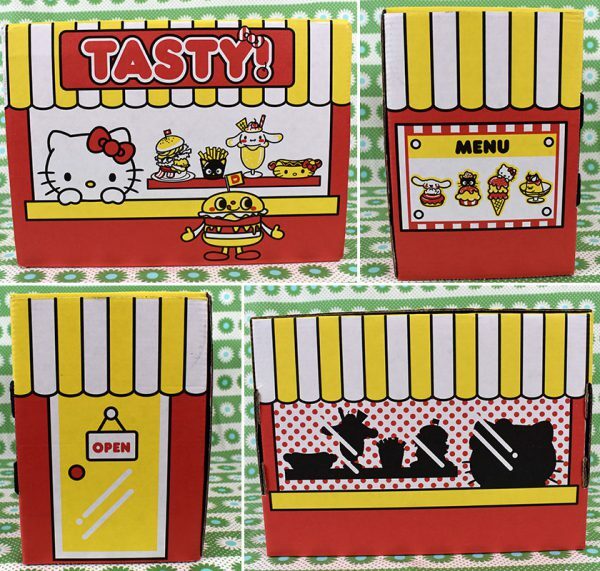 This time, the box turns into an adorable fast food stall! Almost worth it just for the box. 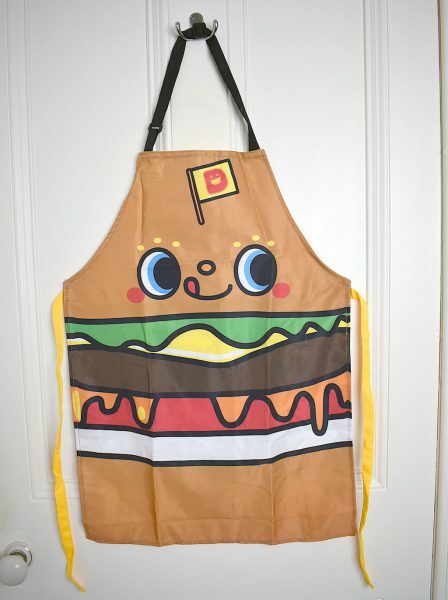 I couldn’t fit it into the top photo but my favourite item is this burger apron. It’s so kawaii and really well-made and fits perfectly. I’m terrible at remembering to wear an apron but it’s hanging up in my kitchen now. There were some other practical items too: a Gudetama bento box and mini cool bag. I used a bento box exactly like this (with a Totoro theme) when I had an office job – you can really fit a lot of different things in it. 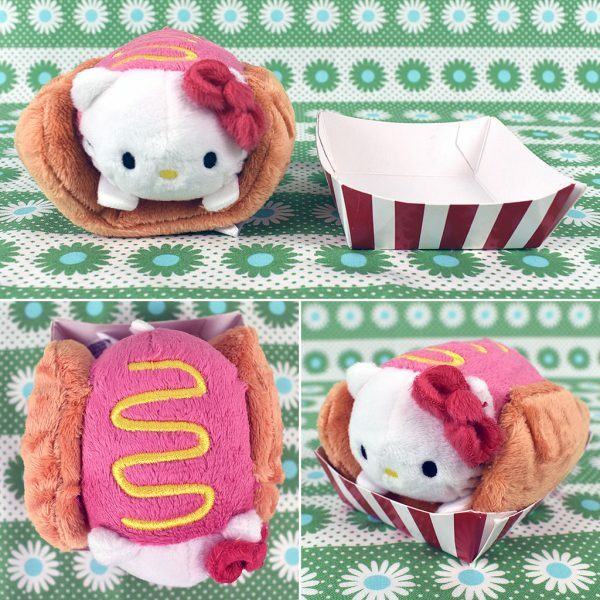 Hello Kitty as a hot dog? Yes please. This is such a cute little plush and I love the cardboard carton. This set of vinyl coasters is so colourful. I’m not sure they’re heavy enough to work as coasters, but they’re too cute not to try. 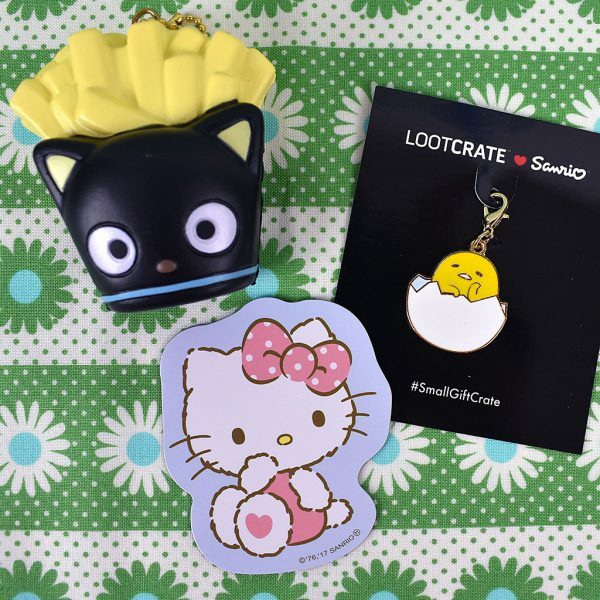 And the rest: Chococat fries squishy, Gudetama enamel charm and Hello Kitty magnet. Overall, I loved this box and will be keeping the apron, plush, cool bag, squishy and maybe the coasters. My only issue this time is that my box took 24 days to be delivered AFTER arriving in the UK. Loot Crate were very helpful, and would have sent me a replacement box, but who knows where it was all that time. 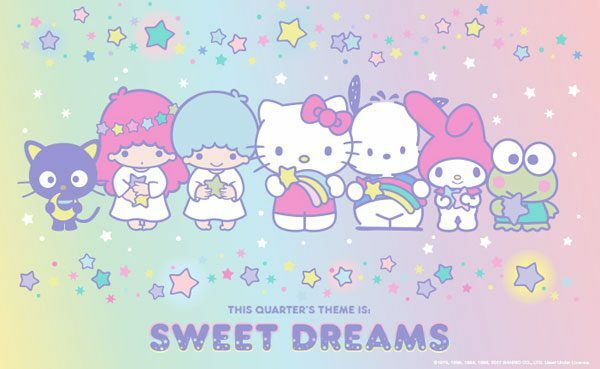 The next box has a Sweet Dreams theme, which looks very pastel and sparkly. 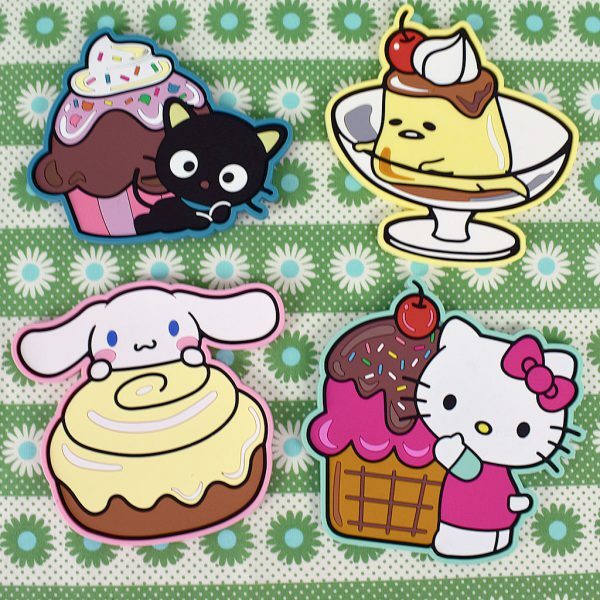 I’m stopping my subscription for now but I wouldn’t hesistate to recommend it if you’re a Sanrio fan. It’s a really high quality, affordable box with all-exclusive items. Check my review of the Summer box for more information and pricing, or compare with other kawaii boxes in our Guide to Subscription Boxes. Oooooh! I love it! 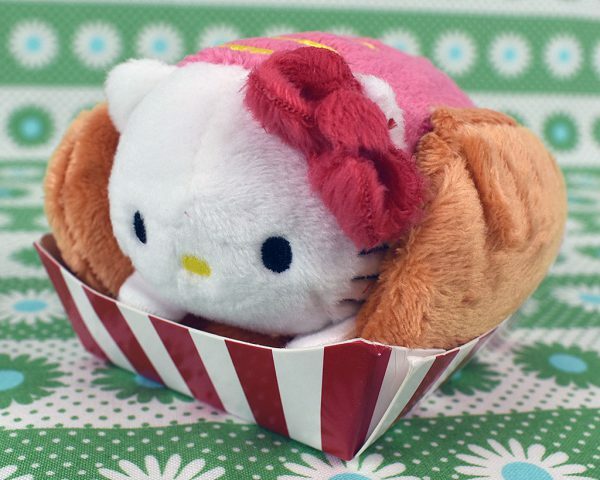 Love Sanrio but I’ve been giving a lot of thought wether to get it or not! But that Sweet Dreams Crate might be worth trying! I think it’s good value, especially since everything is exclusive. You just need to check that the promo images for the next box theme includes your favourite characters as they’re usually the only ones that appear in that box. Hi Marceline! Been reading a lot of your newsletters (very pleasant and fun by the way!) 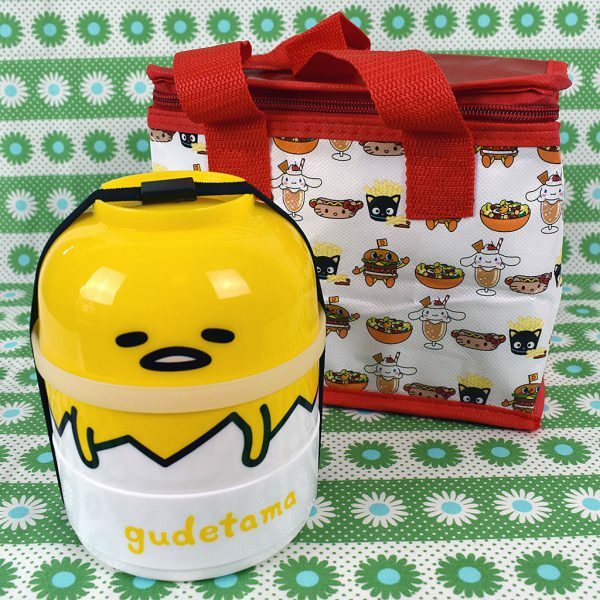 , and this one really caught my attention, because I’m a HUGE fan of Gudetama ^^ I tried to find the very cute bento box, but I can’t find it anywhere, even on the Sanrio store :'( .Would you recommend a shop where I can find it? Or I’m ready to purchase it from you if you don’t like it!